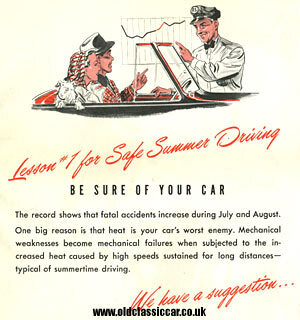 A road safety leaflet from the late 1940s. Homepage. 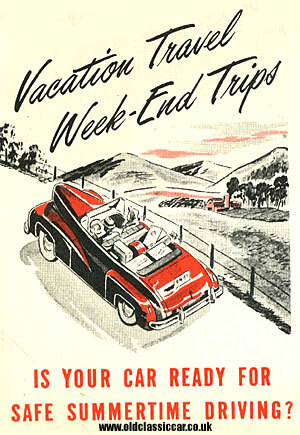 This page: A US leaflet issued in the late 1940s, advocating road safety through regular car maintenance. "Invest in a Summer Safety Check-Up for your car". This fold-out leaflet dates to the late 1940s, and I think was an initiative driven by the Collier's magazine, a then-popular publication across the US and beyond, that went out of business at the end of 1956. This road safety idea was rolled out in conjunction with automobile repair shops across the land, this one for instance features a letter-headed note from the Magruder Motor Co Inc., of 209 First Avenue South, Glasgow, Montana, advocating that all cars should receive a health-check prior to a summer's motoring. "Dear Friend, You - your car - and Safety are our business. Before you start the summer season, why not drop in and have us give your car a Summer Safety Check-Up. You will undoubtably want to have us lubricate your car, change the oil, check the spark plugs and timing. For your own peace of mind, why not also authorize us to make the 5-Way checkup listed on the fold of this page, as recommended by Collier's current article. We will then report our findings to you and give you an estimate on any repair or replacement that might be called for." "Too few people realize that highway casualties in 1946 and again in 1947 were greater than our casualties of war from Pearl Harbor to V-J Day. Too large a percentage of these accidents were caused by mechanical breakdowns that regular preventative service could have avoided. For your sake, for your family's sake, have your car given this minimum 5-way check-up now." "A 'Summer Safety Check-Up' is particularly important. A peak of automobile accidents is reached in July and August. The driving risk is greater in summer because the highways are more crowded and cars are driven farther and faster. The terrible toll of summer accidents - and the number of roadside breakdowns - can and should be reduced. Your service man is equipped to make a quick, efficient and economical 'Summer Safety Check-Up' on your car. Don't gamble with safety." Wise words indeed, and as relevant now as it was back then. The leaflet has a number of fine illustrations sprinkled throughout, showing motor-car owners and their local, reliable and trustworthy motor-car mechanic, complete with P.S. badge on his hat (P.S. for 'Preventive Service'). Were all repair shops able to sign up to this, or selected ones only? 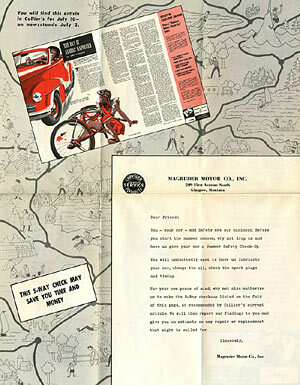 The Magruder Motor Company for instance was a Chrysler - Plymouth Approved Service outfit.